Are Your Carpets Ready For Some Holiday Fun? The holiday season is here, which means you may expect an increase in foot traffic, especially if you are having an office party. But what happens when one of your co-workers gets a little too carried away and accidentally spills a beverage or food on your carpets? What is your response protocol? The best response is to take immediate action on the spill before it becomes a stain. First, use a clean white cloth to blot out the stain as much as possible – do not use the cloth to rub the spill as this can make it go deeper into the carpet fibers. After blotting, use an appropriate solution to properly remove the stain. One solution that works well is Red Out, which can be found at your local specialty flooring store or from a certified cleaning technician. When using Red Out, treat the affected area by spraying the product on the stain until damp. You must use a white cloth (other colors can fade your carpet), then place the damp cloth over the affected area for approximately two minutes. Once the two minutes are up, grab an iron and put it on the steam setting, then place the iron on top of the damp cloth. The steam will effectively lift the spill onto the cloth. You can repeat this process until the spill is gone. If you don’t have Red Out on hand, then using club soda, soda water or tonic, or white vinegar and dish soap with water are good alternative solutions. When using club soda, soda water or tonic, first you will want to blot out the spill as much as possible with a clean white cloth, then pour either club soda, soda water or tonic over the spill and continue to blot until the stain comes out. If this process doesn’t work, or if you don’t have club soda, soda water or tonic on hand, then you can also try a mixture of white vinegar, dish soap, and water in a misting bottle spray. Simply use ¼ cup of white vinegar, one tablespoon of dish soap and fill the spray bottle with water. Spray the affected area liberally and let it soak for about 5-10 minutes and then move forward with the blotting process with a clean, dry white towel until the stain is removed. If you find yourself with too many spills or stains to try and clean up then it may be best to contact a professional carpet cleaning firm, preferably one that is certified by the Institute of Inspection Cleaning and Restoration Certification (IICRC). The IICRC certificate is earned through study, experience and successful completion of formal, written examinations, and maintained by completing continuing education credits. Mister Kleen is certified by the IICRC and we are ready to take on your carpet stains. There is no sense in spending time cleaning up stains when you should be focused on more productive things to do. Also, you don’t want to risk making your carpets look worse. Not only can Mister Kleen’s carpet cleaning technicians tackle your stains, but we can also provide you with recommendations to properly maintain and keep your carpets clean and look their best. 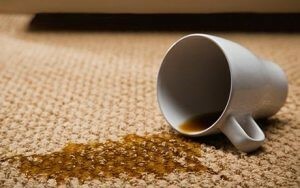 Don’t let stains on your carpets ruin the fun of this holiday season. Use the tips from this article to help you remove the stains before they become a sight for sore eyes. And if you find that you have too many stains to remove, or would like a deep restorative cleaning of your carpets, then contact us to schedule a free quote today.